Apple's latest iOS 7 comes with many useful features that open a new chapter for iOS. One of these newly-embedded features is the AirDrop, which main function is for wireless file sharing between iPhones. With this feature, iPhone users will be able to share photos, websites, locations, videos and other contents with other nearby iOS 7 devices. 2. Wi-Fi and Bluetooth should be turned ON or enabled for the AirDrop feature to work. 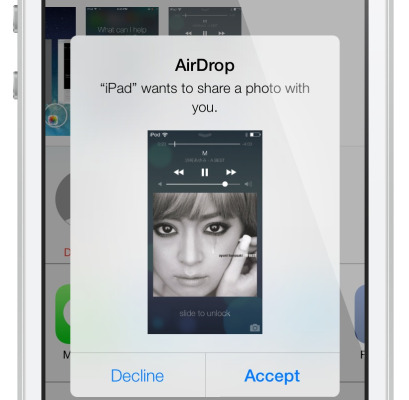 How does iOS 7 AirDrop work? AirDrop mainly uses Bluetooth to search nearby devices within around 30 feet. To transfer files, it uses a private, temporary WiFi mini-network. This means that both sender and receiver should have Bluetooth and an active WiFi to allow file transfer via AirDrop. 1. Choose an active recipient. Your recipient has to have a receiving iPhone or tablet, running iOS7 or later OS version. Please refer to the aforesaid devices compatible with AirDrop function. 2. Open and select the file(s)/content(s) you want to transfer/share. Hint1: If you don't see a Share button on your app, it means you cannot use AirDrop. 4. Wait until the Share sheet appears. Hint2: Other photos and videos will appear on the top row of the Share sheet by the time you send a photo. This will allow you to select additional items to send. An indication of each selected items ready for sending/sharing is the blue checkmark. 5. Tap the icon of the contact (recipient) you want to share the files with. Your recipient will then be prompted with a message, telling him/her about your offer to share some contents. Hint3: You can select more than one recipient per file transfer. 6. Your recipient(s) may either tap Accept if they want to take the contents you offer. Doing so will initiate the transfer, otherwise, the transfer ends. The files you sent will automatically open up in the relevant application. An indication that the AirDrop file transfer was successful is the prompt "Sent" on your screen. If your recipient refused to take the transfer and tap Decline, you will be prompted with the word "Declined" on your screen. iOS 7 AirDrop feature is different from the OS X AirDrop feature. The OS X AirDrop is exclusively used for sending files between Macs while the iOS 7 AirDrop between iPhones and/or iPads. File transfer between iPhones and Macs via AirDrop cannot be done. You need to sign in to your iCloud before you can share files/contents with your contacts.